Born in East Africa, Yusuf has few qualms about the journey he is to make. It never occurs to him to ask why he is accompanying Uncle Aziz or why the trip has been organised so suddenly, and he does not think to ask when he will be returning. 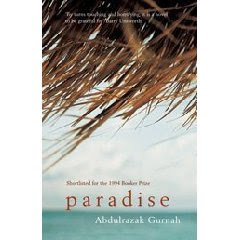 But the truth is that his 'uncle' is a rich and powerful merchant and Yusuf has been pawned to him to pay his father's debts, Paradise is a rich tapestry of myth, dreams and Biblical and Koranic tradition, the story of a young boy's coming of age against the backdrop of an Africa increasingly corrupted by colonialism and violence. Abdulrazak Gurnah was born in 1948 in Zanzibar and teaches at the University of Kent. He is the author of the novels Memory of Departure, Pilgrims Way, Dottie, Paradise, Admiring Silence and By the Sea. His fourth novel, Paradise (1994) was shortlisted for both the Booker and the Whitbread Prizes.